London SW3 4HP, 68 Royal Hospital Road, is an address that has been associated with haute cuisine for almost four decades now. First it was the home of Pierre Koffmann's famed three-star restaurant La Tante Claire from 1977 till 1998, when Gordon Ramsay established his first solo restaurant here, Restaurant Gordon Ramsay. The restaurant was awarded three Michelin stars within three years after its opening and has held this accolade ever since. Even though the restaurant still has Gordon Ramsay's name above the door, the man himself is not behind the stoves. Clare Smyth has been the head chef for years. 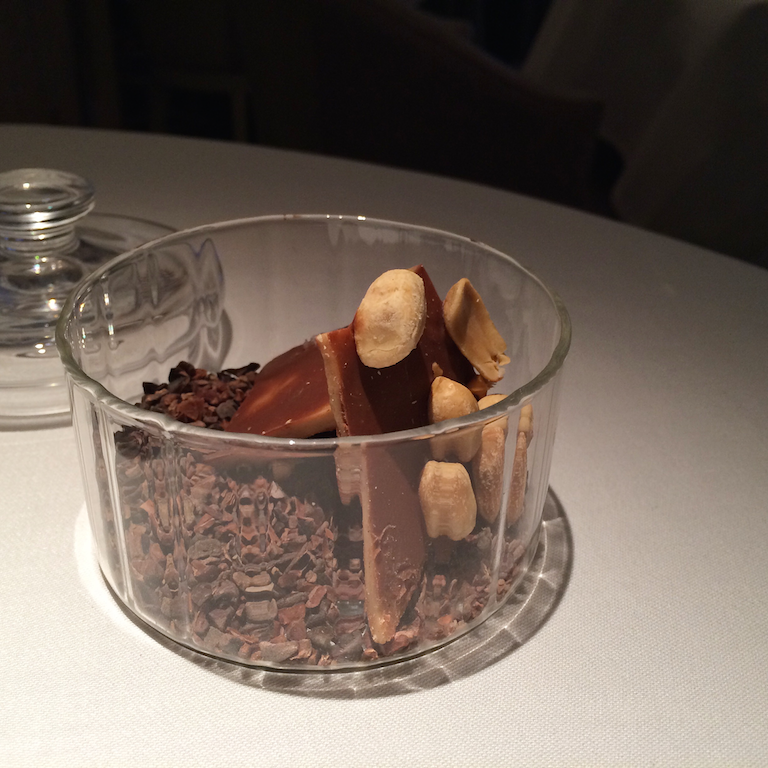 Clare Smyth (b. 1978) joined Gordon Ramsay's kitchen team back in 2002 and was appointed as senior sous-chef within a few years' time. In 2005 Clare left London to spend two years abroad working for Alain Ducasse at his 3-star restaurant Le Louis XV in Monaco and for Thomas Keller at his 3-star restaurants Per Se and The French Laundry. She returned to the mothership in 2008 and was made head chef. Just two years ago, in February 2013, it was announced that Clare Smyth had become a partner in the restaurant, and thus chef-patron, making her the first and only UK female chef to run a 3-star restaurant. To mark this new chapter of Restaurant Gordon Ramsay, the restaurant's interior was completely refurbished. Restaurant Gordon Ramsay is open for lunch and dinner Monday through Friday. The restaurant offers an a la carte menu, including a separate vegetarian menu (3 courses £95), a 7-course Menu Prestige for £135, a 7-course Seasonal Inspiration menu for £195, and there's the 3-course lunch menu for £55. 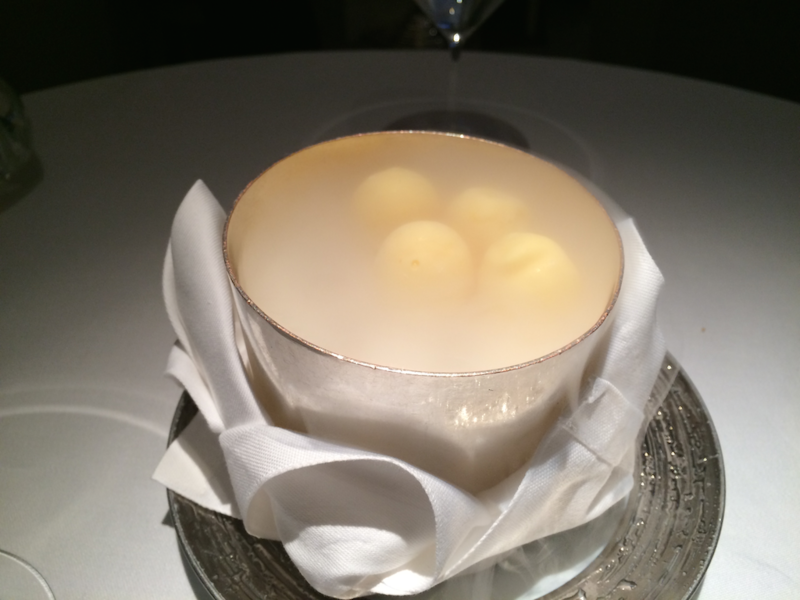 I had lunch with my husband at Restaurant Gordon Ramsay on Friday 13 February 2015 and we both ordered 3 courses from the a la carte menu plus an extra seasonal truffle dish. 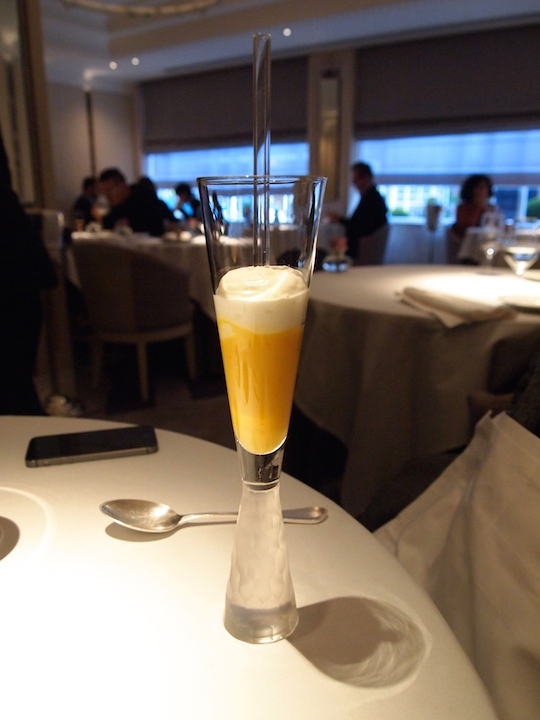 First to arrive was an amuse bouche of baked potato mousseline, smoked egg yolk, an intense Parmesan cheese foam and black truffle. A truly delicious dish with a very elegant smokiness. My first course was a visually attractive dish of poached Scottish lobster tail with lardo di Colonnata, pickled vegetables and fresh herbs. The lobster tail was plump and juicy and was placed in a circle of crunchy pickled vegetables, such as baby carrots, artichokes, turnips, onions, cauliflower and radishes, with some thinly sliced lardo di Colonnata carefully placed in between. All the vegetables were dressed with a light, mayo-based dressing. A vinaigrette of the lobster's coral, skinned tomatoes, tarragon and a touch of Sambuca was spooned around the lobster and vegetables. A fabuously elegant and refined dish with spectacular flavours. There's the freshness of the vegetables and the juiciness of the lobster on the one hand, and there's the warmth and intensity of the dressing on the other. The dressing really packed a punch, the coral adding a touch of lightness but also texture. Lovely aniseed flavours from the tarragon and Sambuca, that complemented the lobster wonderfully. This was followed by an extra course of buttered and truffled homemade linguine, served with a foamy and creamy Parmesan cheese sauce and generously topped with freshly shaved Périgord truffle. 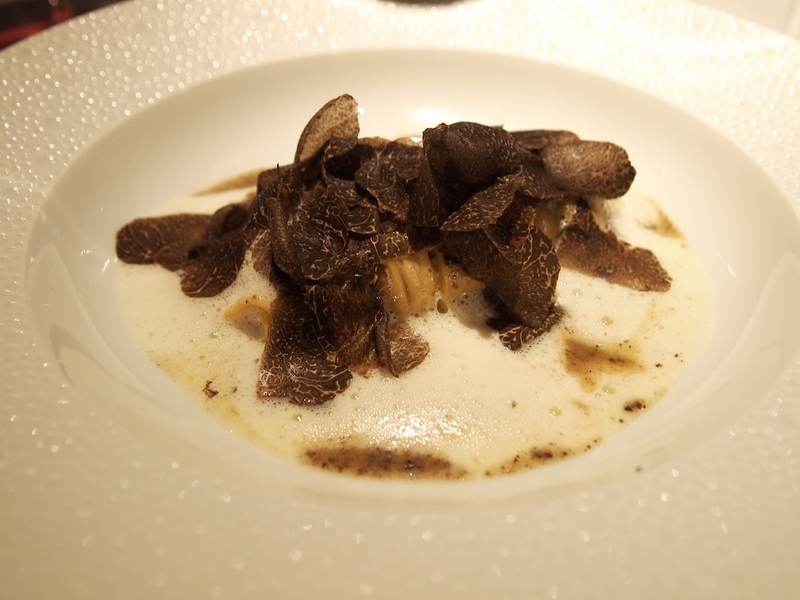 Personally, I think there's nothing quite like fresh, eggy pasta, salty-sweet Parmesan and earthy black truffle, because these ingredients have such a strong affinity with each other, and this rendition of the theme was exquisitely done. My main course was Isle of Gigha (Scotland) halibut, with Atlantic king crab, cauliflower "couscous", finger lime and ras el hanout infused broth. Beautifully cooked halibut with moist, creamy and slightly firm snow-white flesh, and placed on delicious cauliflower couscous mixed with finely chopped red pepper and pine nuts. 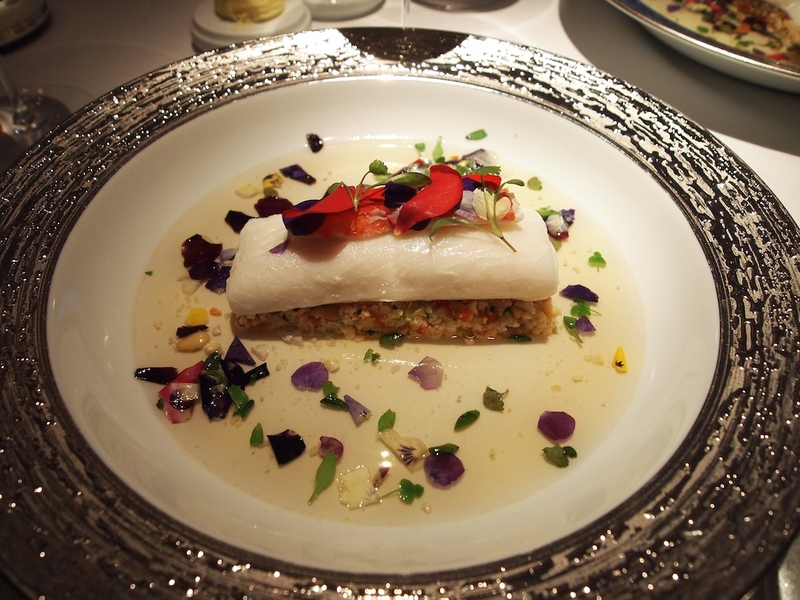 Two pieces of tender king crab were on top of the halibut, together with some finger lime caviar. Lovely flavour and texture from the cauliflower couscous and the finger lime caviar enhanced the flavours in the dish perfectly. The fragrant ras el hanout broth was poured around the fish tableside. In the broth were edible flowers and the ras el hanout turned out to be Clare Smyth's own distinctive but extremely elegant mix of spices, including cumin and coriander, and the broth was finished with a touch of rose water. Stunning cooking on all levels. Pre-dessert was a delicious mango, passion fruit and jasmine cocktail. 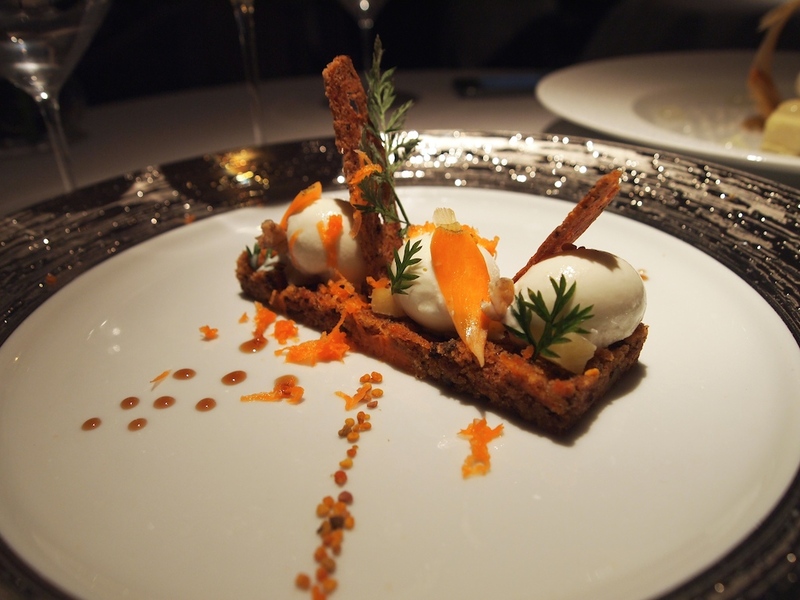 Dessert was Carrot cake with mead, bee pollen, cream cheese ice cream, cicely, carrot crisps, and some freshly grated carrot. A rectangular slice of carrot cake with with a dense yet moist texture, some chopped walnuts in there for crunch, and beautifully seasoned with warm spices. The cream cheese ice cream was fresh, creamy and both the characteristic textures and flavours of ice cream and cream cheese were incorporated. A really smart version of the humble carrot cake, presented in a new form, with familiar flavours, but with new textures. Chocolates and sweets to go with our coffees, including rosewater Turkish delight, peanut brittle and the restaurant's signature iced white chocolate bonbons. It had been over 2 years since my last visit to Restaurant Gordon Ramsay ("Gordon Ramsay"), but with this meal the restaurant convincingly ticked all my three Michelin star boxes once again. Gordon Ramsay is not the type of restaurant that's on a quest for the latest novelty, so it is perhaps not a restaurant for people searching for the latest trends and foraged leaves. However, the restaurant is on an ongoing quest for perfection, resulting in exceptional cooking with top-quality ingredients of outstanding provenance, and flawless service led by maitre d'Hôtel Jean-Claude Breton. 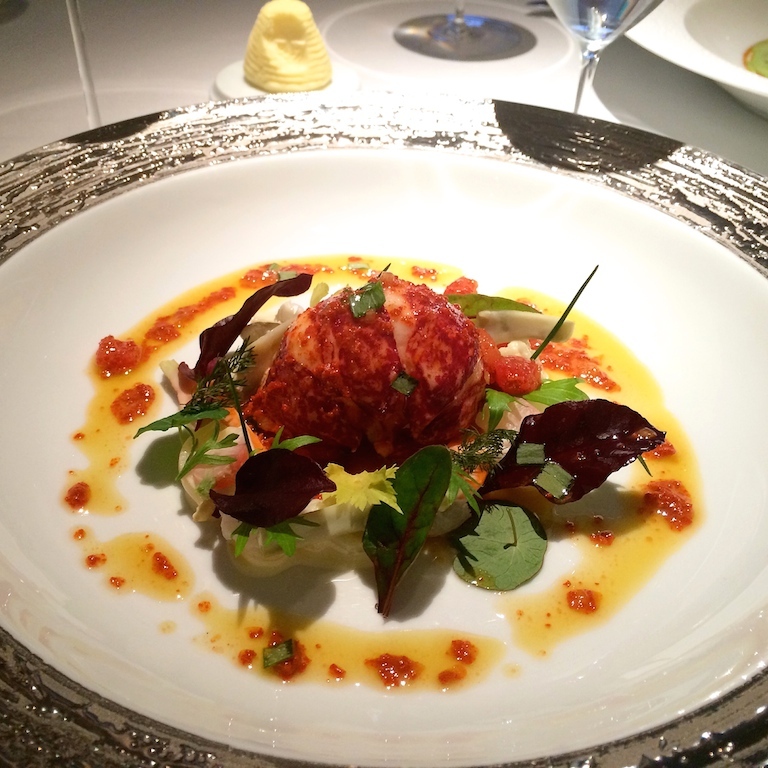 Both the lobster and halibut dishes were perfectly executed, with superior and vibrant flavours. 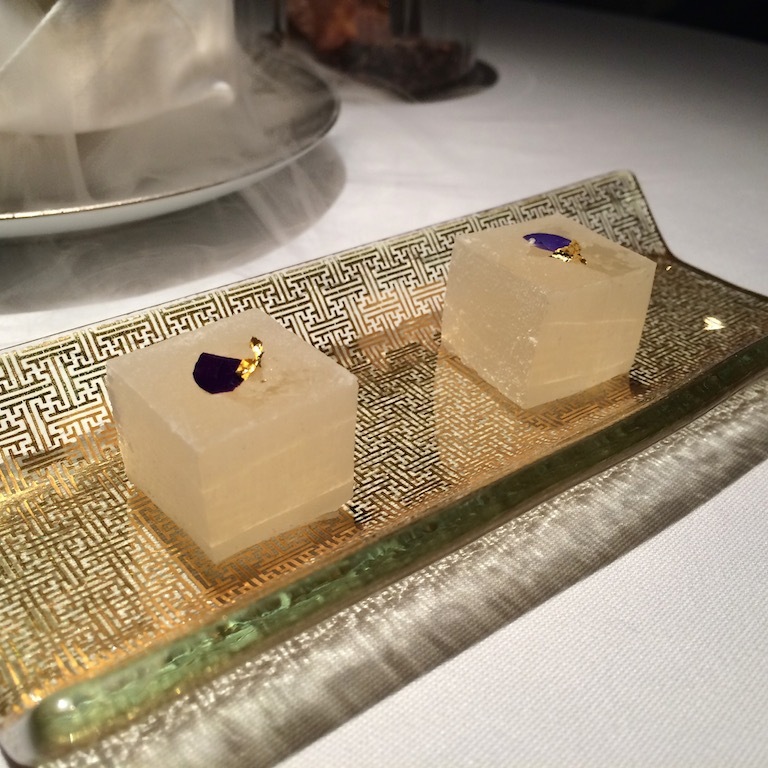 I felt fortunate that I had ordered them as (much larger) à la carte portions, which enabled me to really explore all the finesse and detail that Clare Smyth's feminine but firm hand had imbued them with. Futhermore, I can only applaud the restaurant for putting a deceptively humble dessert such as carrot cake on the menu - there was real precision below the comforting surface. 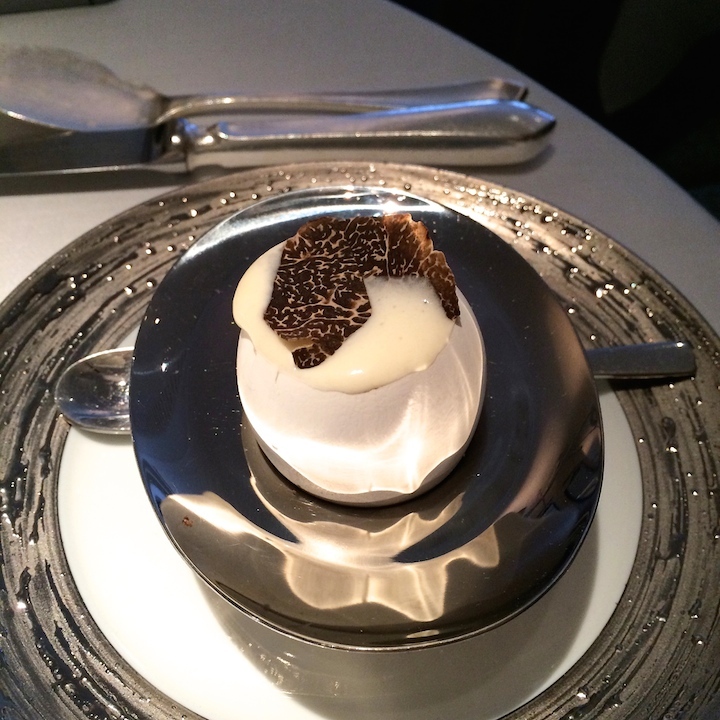 Gordon Ramsay was and still is one of the finest tables in London.